If you haven’t read the News Press story “Anatomy of the Deal” about Hertz selecting Lee County Florida to relocate its world headquarters to you’re missing out on some fascinating behind the scenes tales full on mystery, intrigue, and suspense as if it was right out of a top selling suspense novel. Hertz Deal Underscores Importance of Confidentiality. It was fascinating to read about how that deal transpired from beginning to end. It further underscores why confidentiality is a requirement in deals like this. 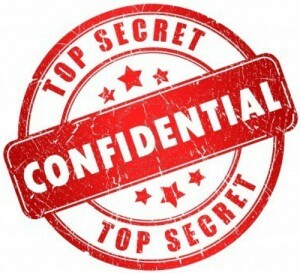 In the past we’ve worked with professional athletes, movie stars, and other famous people so we’ll shed a little light on some things people don’t always think about confidentiality. We had two athletes who played in many Super Bowls interested in buying property in SW Florida. They both purchased and one bought multiple properties because of the confidentiality extended to them. One man was rather large and tall, in excess of 340 lbs. Before he came to SW Florida we sent him video tapes of selected properties that met his needs. We’d go out and video the properties on his behalf. At one SW Florida community the salesperson stopped us and said they would do the taping for us, that we were not good enough and they wanted to show their product in the Best possible way. We’re sure they would have done a marvelous job, but what they didn’t realize who the client was and what they were looking for. We were videoing entrances to the closet so he could tell if he would fit. The same was true with doorways and bathrooms. The salesperson thought we were nuts and not very good, but we knew what was important to him. He knew we selected nice properties, but they were no good to him if he couldn’t enjoy life within the property. That’s what he wanted to see. We couldn’t disclose who the buyers were as they were fairly well known and they valued their privacy. They wanted to come down to SW Florida and enjoy it, not be mobbed by fans or interested onlookers. A few years ago I heard a rumor that Kenny Chesney was looking at property in Key West but nixed the deal when word got out he was buying. I have no idea how true this rumor was but it could be as famous people like to keep secret what they’re doing for as long as possible. I remember negotiating land deals and in many cases the original contract was an unnamed buyer. Sellers don’t like this but there were reasons. Children’s Miracle Network wanted to build a facility but needed confidentiality. We met with company representatives out of state and began the process. They knew that we were contributors to the network as we had contributed money from every Ellis Team closing to CMN for years. We still do today. Sande is a CCIM so they wanted local expertise and someone they could trust. They knew we believed in them and they believed in us. Their facility now sits on Colonial Blvd and helps children from all over SW Florida and reduces many trips to Tampa. We worked with builders who were competing with other builders for communities so they didn’t want it known which land parcels they were bidding on. If word got out, prices could go up or another builder could speed up a development order and take away chances another community would be allowed given the existing road and water resources. In the case of Hertz, employees back home hadn’t been told yet. Tulsa was a competitor to SW Florida. I can just imagine many from NJ wouldn’t move to Oklahoma, and many from Oklahoma wouldn’t go to NJ. SW Florida just seems like a nice place key employees from either might go to, and we agree. In the end, it all worked out for SW Florida. We weren’t in the know in this deal, and that’s OK. We didn’t need to be, and neither did anybody who wasn’t closely involved. Companies choose locations for their reasons. The fact that we all found out who the mystery company was the day it was announced served everyone well, and that’s the way it should be. Relocation is a stressful thing and involves a lot of people so it wouldn’t do a lot of good getting people riled up about various locations. 7 sites were considered locally for Hertz. Imagine the public interest had Hertz been revealed and speculation as to which location was selected. Welcome to Southwest Florida Hertz. We think you’re going to like it here. I know I’m joining the Hertz #1 Club. We hope everyone here does too. Posted in Cape Coral, Cape Coral Real Estate, Fort Myers, Fort Myers Real Estate, Southwest Florida Real Estate.Tagged Children's Miracle Network Fort Myers, Hertz confidential deal, Hertz Deal Underscores Importance of Confidentiality, Kenny Chesney Key West, Lee County Florida, News Press story Anatomy of the Deal, Sande Ellis CCIM, Southwest Florida Hertz, SW Florida business.